Wisdom is a power metal band from Budapest, Hungary and they were formed in 2001, so far they have released four albums and "Rise of the Wise" comes to be their latest record, it is so compact and loaded with classic stuff for a melodic power metal band, structure with abundant melodies, guitar riffs and solos, powerful rhythm section, the epical rush inflicted, clean vocals and undeniable catchy choruses, has everything that a power metal fan is craving for, still unconvinced? Well! If your taste goes for bands like early Edguy, HammerFall, Helloween or Sabaton then I'm pretty sure you will enjoy this album. 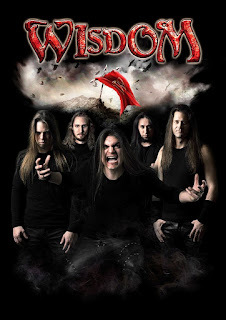 Despite the album falls in Wisdom traditional songwriting formula and many will probably judging by this, however is not a fatal boredom because has its moments and they know how to capitalize them, by bringing different pace and dynamics to keep you fully engaged to their metal anthems, before we get down to track by track let's see Wisdom current lineup formed by original members Gábor Kovács and Máté Molnár in guitar and bass respectively, complemented by vocalist Gábor Nagy, the drummer Tamás Tóth and the newest addition the guitarrist Anton Kabanen former Battle Beast from the Finnish heavy metal band. "Over the Wall" opens the album and certainly I don't get the idea with an intro of this magnitude, marching drums and strident guitar work that suddenly stop at nothing and quickly connect with "Raven's Night" which is fast and builds up in melodies the clean vocals by Gábor are perfect and the backing vocals make this track energetic and lead to a superb guitar solo, everything here sound tight and strong, "My Heart is Alive" is a medium pace track with an excellent rhythm section structured between Tamás who is pummeling the drums and Máté in the bass laying dark tunes, choruses embrace this piece and definitely you will end up singing along, let's skip up to "Hero" which star with a folk passage only to exploit with the speed and frantic riffing well known, the double bass drum sounds bold and fearless, super fast guitar solo while charming choruses ends the track, after the second track the album seems fairly balance between fast pace which reflect the intensity and energy captured whilst medium pace embrace the cadence of melodies and diligent onslaughts, Through the Fire" and "Nightmare of the Seas" would fit properly to the description, the last one with somewhat folk-ish vibe, how could we lose a ballad in this album? "Believe in Me" takes care of it, with subtlest acoustic guitar work, interweaving few electric guitar chords and an acceptable guitar solo, "Secret Life" and "Welcome to My History" are relatively medium pace tracks well integrated with the classic sound of power metal, epic riffs, ceaseless double bass drum, choruses and loud guitar solos, while the closing track count with an stellar participation by Sabaton frontman Joakim Broden and quickly injects its essence and tone of voice but; What really hook you to this track is the vocal work of Gábor doing a duet beside Joakim. 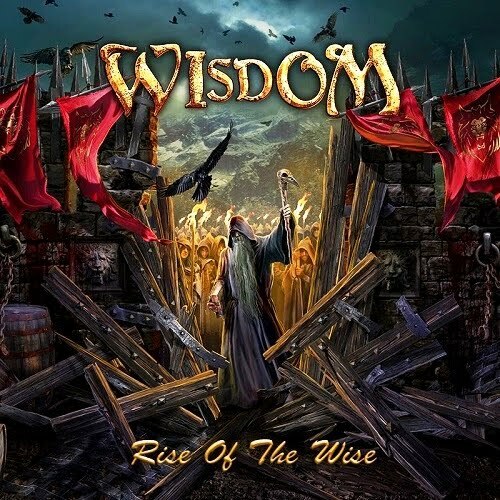 So, in the end what we have is a strong continuation of what Wisdom have always been able to do, there is nothing out of their formula, if you are arriving to the genre to experience something unique, I'm afraid you will be disappointed, because Wisdom is a constant machine and so far they haven't pushed out the boundaries, still a good album for power metal lovers but; I’m still not sure if Wisdom will be a force to reckon with in the years to come.